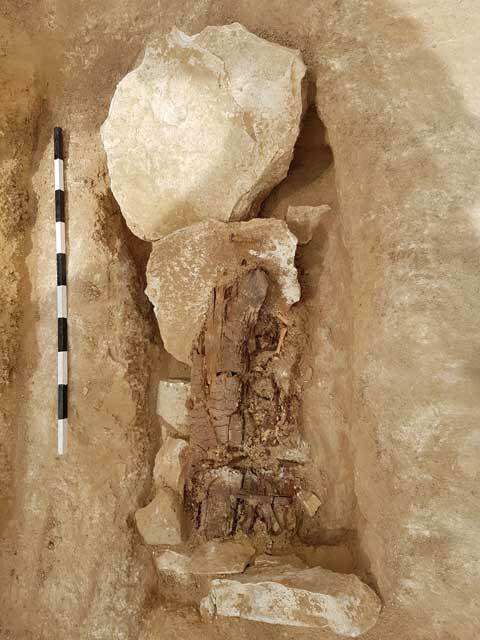 In July 2016 and April–May 2017, salvage excavations were conducted to the south of Tel Malhata (Permit Nos. A-7768, A-7962; map ref. 202075–682/568279–766; Fig. 1), prior to construction within the Nevatim Air Force Base. The excavations, undertaken on behalf of the Israel Antiquities Authority and financed by the Ministry of Defense, were directed by S. Talis (photography), Y. Nagar (physical anthropology) and E. Aladjem, with the assistance of N. Lect Ben Ami, D. Eisenberg-Degen, F. Kobrin, V. Lifshits and H. Hammer (area supervision), Y. Al-ʽAmor (administration), M. Kahan and A. Hajian (surveying), I. Delerson (drafting), Y. Kupershmidt (metallurgical laboratory), A. Golani (jewelry identification) and C. Amit (studio photography). 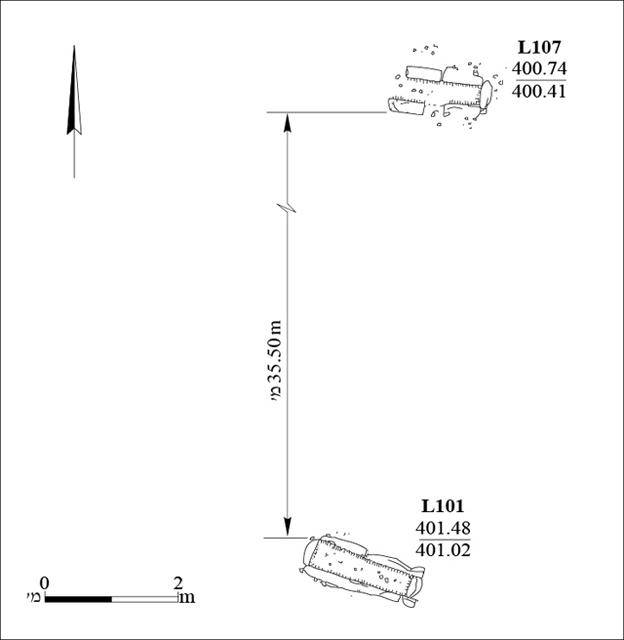 Two excavation areas (A, B; c. 4 dunams; Figs. 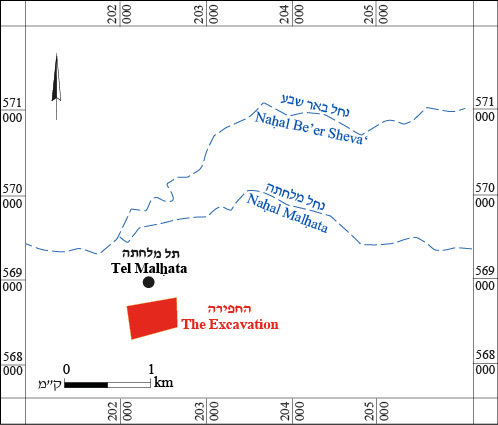 2, 3) were opened in the Be’er Shevaʽ Valley, south of the confluence of Nahal Malhata and Nahal Be’er Shevaʽ, yielding eighty-seven graves (L101–L183, L186, L192–L194) and incineration pits (L184, L185, L187–L191). The high aquifer in the Be’er Shevaʽ Valley made it possible to dig wells that provided copious amounts of water. The landscape is typical of the northern Negev, and is characterized by plains and gentle hills composed of loess and chalk. Rainwater flows over the hills and drains into the streambeds, exposing chalk and flint that were used as building material during various periods. The available water resources and building materials facilitated the founding of agricultural settlements in the area. Tel Malhata, which served as an administrative and agricultural center for many periods, lies some 780 m north of the excavation area. Remains ascribed to the Chalcolithic, Middle Bronze, Iron, Hellenistic, Roman and Byzantine periods were discovered in previous excavations conducted on the tell (Beit-Arieh and Freud 2015). Buildings with spectacular mosaic floors and c. 300 tombs were discovered in the Byzantine-period settlement, unearthed in an excavation conducted south of the tell (Eldar and Baumgarten 1992). Burials. Eighty-seven cist tombs and pit graves (average dimensions 0.8 × 2.0 m, depth 1.1–1.7 m) were discovered. They were dug in a northwest–southeast direction into a loess soil containing a high density of chalk conglomerate. The cist tombs were constructed of roughly hewn chalk and flint slabs that were placed in narrow trenches dug at the bottom of the graves. 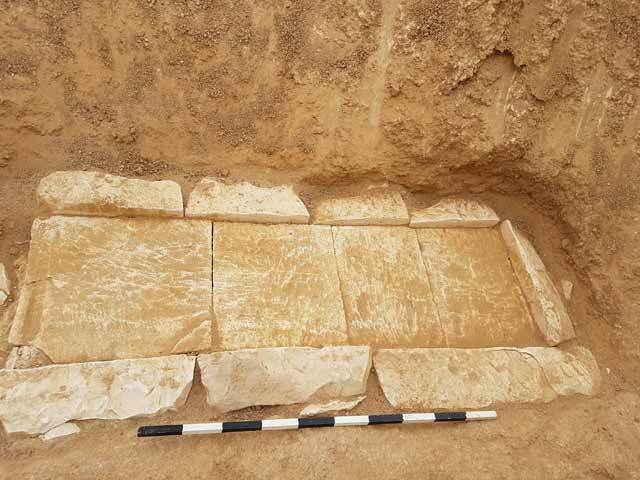 Two to four slabs (0.23–0.45 × 0.25–0.90 m, thickness 6–11 cm) were set along the longitudinal walls of the tombs, and one slab was inserted along each of the latitudinal walls. The tombs were covered with two to six stone slabs (0.35–0.57 × 0.44–0.90 m, thickness 8–10 cm), which were supported on the sides by small stones. Some of the tombs were covered with well-dressed chalk slabs (Fig. 4). Several of the cist tombs were paved with stone slabs. The pit graves were covered with roughly hewn stone slabs, mud-bricks or earth. One of the graves (L194; Fig. 5) was covered with mud-bricks that formed a gable. Most of the deceased were placed in the funerary position characteristic of cist tombs in the Byzantine period, which was practiced by Christian populations: primary burial in a supine position, with the head in the west and slightly raised, the arms bent and hands folded on the abdomen or chest (Peleg 2009). Six deceased were placed on their right side with their faces turned toward the south, as is the custom in Muslim burials (Gorzalczany 2007). Funerary offerings dating from the Roman and Byzantine periods were discovered in the tombs. These included metal and glass jewelry, glassware, coins, bone items, figurines and alabaster objects. Remains of clothes and shoes made of cloth and leather were found on some of the deceased. Remnants of wooden coffins were discovered in a few of the pit graves (Fig. 6). Incineration pits dug in the loess soil (Fig. 7) were discovered in the northwestern part of Area B. 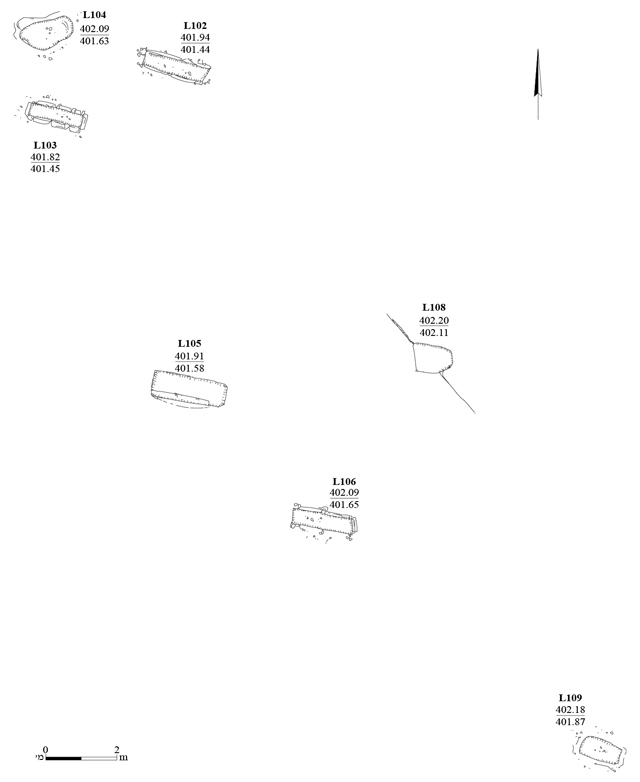 Several of the pits were dug next to each other, separated by earthen partitions (L185, L187–L189), and others were dug into earlier pits that were no longer in use (L184, L190, L191). 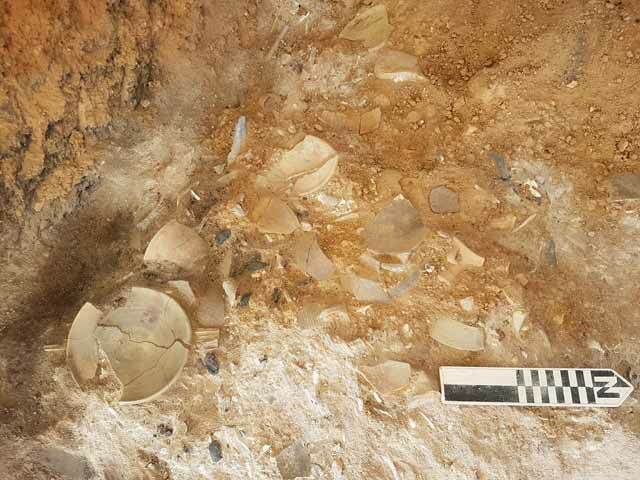 Pottery vessels dating from the second century CE, metal and bone objects, glass vessels, organic material and animal bones were found at the bottom of the pits (Fig. 8). The walls of the pits and some of the contents in them were burnt and intentionally covered with soil. Thus, it seems that the finds were set afire and covered with soil after they had been discarded in the pit, perhaps as part of a mortuary ritual that was customary in the Late Roman period. The tombs discovered in the excavation were used in the Roman and Byzantine periods and are probably part of the cemetery belonging to the settlement that was discovered south of Tel Malhata (HA 1979; Eldar and Baumgarten 1993). 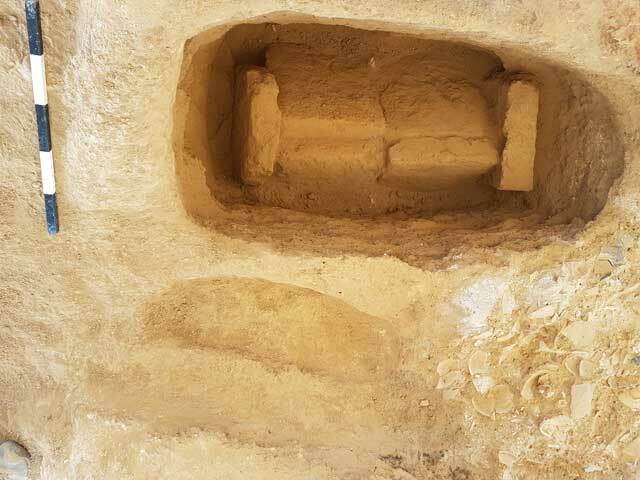 The construction of the tombs unearthed by Eldar and Baumgarten closely resembles that of the tombs unearthed in our excavation as well as other Byzantine-period tombs discovered at sites in the Negev (Nagar and Sonntag 2008). The burial practices indicate that the cemetery, and perhaps the adjacent settlement, continued to be in use at the beginning of the Early Islamic period, as was the case, for example, in the large settlement of Rehovot-in-the-Negev that was abandoned only in the eighth century CE (Tsafrir 1988). Eldar I. and Baumgarten Y. 1993. Malhata in the Byzantine Period. In NEAEHL 3:936–937. Jerusalem. HA 1979. Malhata, the Roman–Byzantine Site – 1979. HA 69–71:10–12 (Hebrew). Tsafrir Y. 1988. An Introduction to Rehovot-in-the-Negev. In Y. Tsafrir. 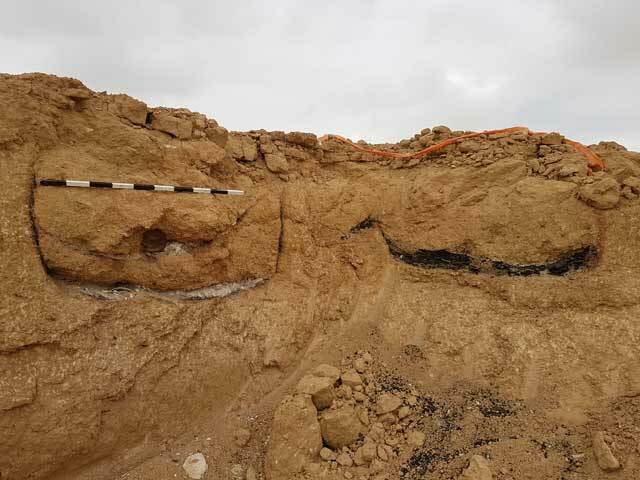 Excavations at Rehovot-in-the-Negev I: The Northern Church(Qedem 25). Jerusalem. Jerusalem. Pp. 1–16. 4. Tomb 144 covered with chalk slabs, looking northeast. 5. Tomb 194 covered with mud-bricks that formed a gable, looking south. 6. Tomb 160 with the remains of a wooden coffin, looking northwest. 7. Incineration Pits 184, 185, 187, 188, looking northwest. 8. Incineration Pit 185 with pottery sherds and organic material, looking west.